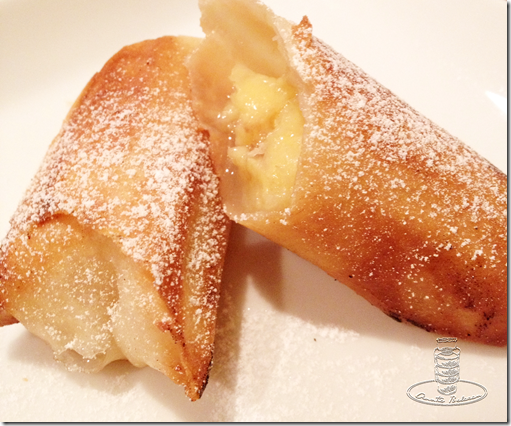 These banana spring rolls are one of my most requested desserts because they come out so fantastically crunchy and sweet. If you do make these, be sure to make extra because they disappear fast! To make these crispy spring rolls, you only need 3 ingredients: bananas, spring roll wrappers and oil. Making these spring rolls are a piece of cake – just cut a banana in half, roll it away from you, tuck in the ends and seal with water. It took me all of 2 minutes to make 4 banana spring rolls. Including frying time, these take about 15 minutes from start to finish. Spring roll wrappers (these are made in Singapore!) can be found in the freezer aisle of most Asian supermarkets and require about 20 – 30 minutes to thaw at room temperature. I like to leave mine to thaw in the fridge overnight. If you have a few minutes to spare, try making a chocolate spider web for the banana spring rolls! Everybody loves it!